​R&D Center - state-of-the-art capabilities and robotic infrastructure, operated by high performance professional R&D team. 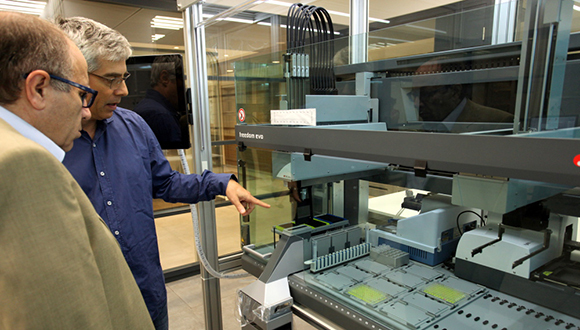 The BCDD is providing a state-of-the-art research in the relevant fields of medicinal chemistry, biological target identification and validation and computer-assisted drug design. We provide development environment and academic platform to foster early stage drug discovery. Our center serves dozens of groups across the Tel Aviv University Campus - as well as other Israeli research institutions and industry. Offering the necessary equipment, expertise and research grants (provided as an in-kind contribution), the BCDD advances lab research breakthroughs, to the stage where they are ripe for later stage development. The Cell Screening Facility for Personalized Medicine (CSFPM) was established in 2010 with the support of the Mexican Friends of Tel Aviv University, for the purpose of finding new drugs for rare diseases using patient derived cellular models. The CSFPM with all its state-of-the-art equipment and acquired know how in automation and HTS assay development is now an integrative part of the BLAVATNIK CENTER for Drug Discovery (BCDD) at TAU. The incorporation of the CSFPM to the BCDD is providing researchers with the technology and knowhow for assay development and drug discovery in the field of orphan diseases.